Are you obsessing about money? Today I want to share with you a powerful tool I use for my clients and myself. It’s incredibly supportive when we are faced with an obsessive thought pattern with money. If you find yourself obsessing over money, there’s typically some kind of fear triggering these obsessive thoughts. Fantasizing about the future with money or regretting the past. It may be fear around the future or fear that things aren’t going to pan out in the way you want them to. Maybe you’re really hoping that you get this next big client, or that you make more money next month, or that you can pay off that debt that’s really bothering you, or pay for that workshop you’re really wanting to attend. Yet you don’t know if the money is going to come, or how. Or maybe you’re feeling guilt doing something you feel you shouldn’t have done with your money, like investing in the last cryptocurrency craze, overspending on gifts for yourself or others, eating out far more than feels good or just generally checking out with money. When our thought patterns or beliefs are based in fear, they can easily spin out of control and become a source of obsession. When we pause and examine the belief at play, we can usually see that we’re engaging in a fantasy, an imagined idea about what we think we want that’s driven by fear. To face and transform these obsessive thought patterns, I created a tool I call The Virtual G.O.D. Box. Here, G.O.D. stands for the Generating, Organizing, and Destroying powers of the creative force. 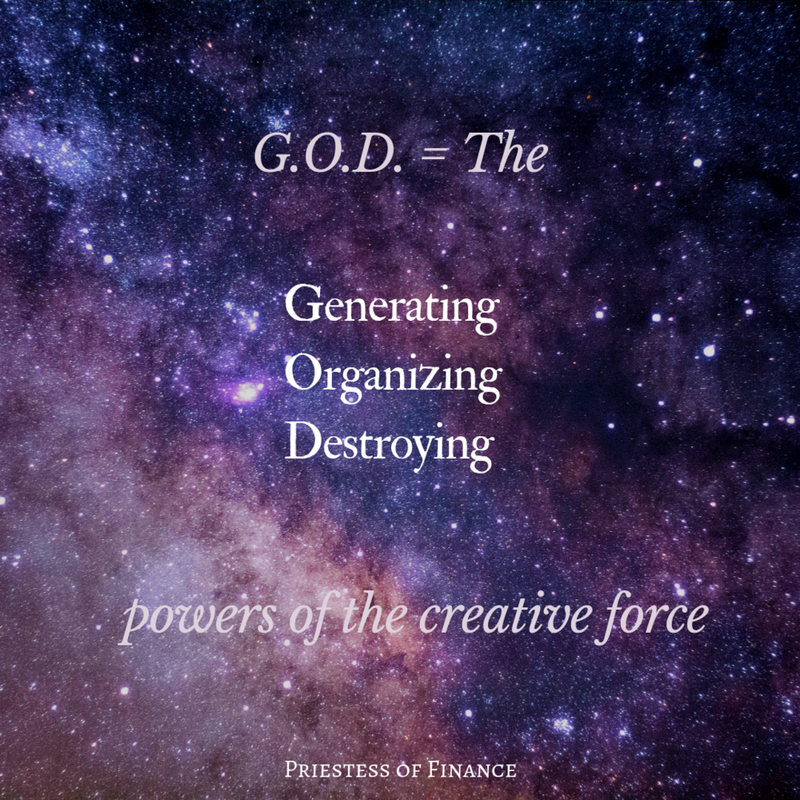 When we find ourselves caught in a loop of obsessive money thoughts, we can imagine an incredible box in our mind that has the power of the creative forces. Generating — generating resources, possibilities, magic, income-generating ideas, and vision. Organizing — organizing our circumstances for us so that we can have more freedom, more peace of mind, more serenity and sanity. And Destroying — destroying fears, fantasies, and limiting beliefs. Any time we find ourselves obsessing with money or anything else, we can take the thought pattern that’s causing us stress and suffering, and imagine putting it into this box. The powers of the universe will help resolve the underlying driving force that fuels the obsession. We can use this tool when we want to manifest a vision, resolve a fear, or find peace with something from the past. When we place our thought pattern into the box, we invest in the idea that these thoughts and patterns will be healed.